The Refined Geek » SpaceX’s CRS-2 Arrives At ISS, Proves It’s Not an One Shot Deal. SpaceX’s CRS-2 Arrives At ISS, Proves It’s Not an One Shot Deal. It’s hard to believe that it was only 5 months ago that SpaceX launched its very first Dragon capsule that was part of the Commercial Resupply Services contract they had with NASA. It was an unqualified success with everything from the launch to capture and finally to docking going as smoothly as you could possibly expect. Even more impressive was the fact that they accomplished this feat no more than 5 months after their previous ISS rendezvous attempt aptly demonstrating that they are very capable of meeting their aggressive timelines, something which many hardened arm chair space nuts like myself were initially sceptical of. Today brings news of another successful flight of the SpaceX Dragon capsule, dubbed CRS-2, which has just docked at the International Space Station. Just like previous missions it’s been loaded quite lightly carrying 677KGs of playload which is about 10% of its total combined (pressurized and unpressurised) capacity. The vast majority of this is taken up with science experiments with crew supplies and replacement parts making up the lesser half. This is also the first time that the unpressurised section of the Dragon capsule has been used which is where the spare station parts were contained. These will be unloaded during an EVA whilst the Dragon is docked at the ISS. CRS-2’s flight up wasn’t without some significant drama that threatened to send it plummeting back to earth. Whilst the initial launch was fine and second stage separation was completed (an area in which SpaceX has had troubles in the past) 3 of the 4 rocket pods contained on the Dragon craft reported insufficient pressurization in their oxidizer system. This in turn triggered another safety system which stopped the solar panels from deploying, a safety mechanism designed to protect the craft in an unsuccessful booster stage separation scenario. 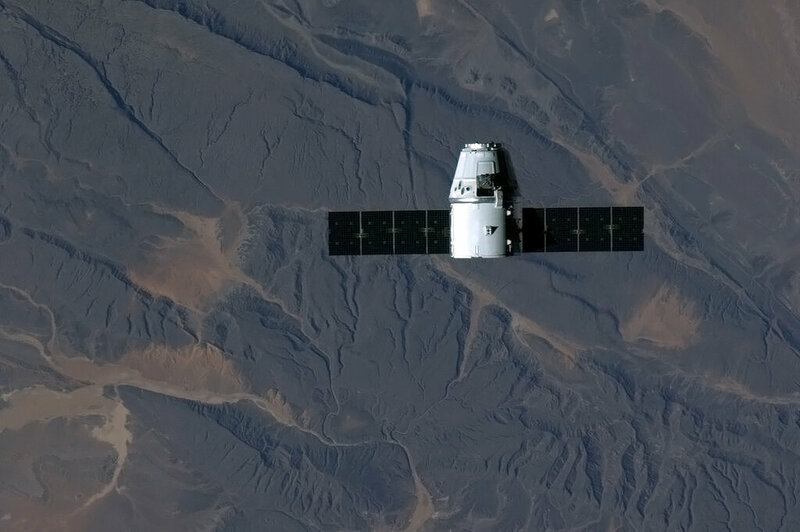 In this state the Dragon would not be able to berth with the ISS and would likely end up plummeting back to earth in a most ungraceful fashion. The Dragon’s internal systems were then overridden and the rocket pods were allowed to continue pressurizing. Shortly afterwards 2 rocket pods were deemed active and the solar panels were deployed. Not long after that all 4 rocket pods were reporting proper pressurization and were brought back online. Whilst not a catastrophic failure it did push back the schedule by a day meaning CRS-2 didn’t dock until early this morning. With this most recent launch SpaceX has shown just how reliable they can be as they’ve hit a launch every 5 months for almost a year. It might not sound like much but comparing that to any other launch system demonstrates just how far SpaceX has come in the comparatively short time they’ve been a company. With this all in mind it’s looking pretty good that they’ll be able to make their 2015 deadline of putting people into orbit which, considering that the replacement from NASA is a long way off, is extremely impressive.